Our chefs are always coming up with new ways to tantalize your taste buds. Below is a great recipe you can try at home. Enjoy! In a large sauté pan over low heat, melt butter. Add lobster and sauté for 2 minutes. Add 3⁄4 cup of the cream and salt, simmer for 2 minutes. 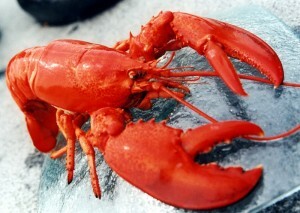 Add the Tabasco and Cognac to the lobster mixture and simmer for 1 minute. In a separate bowl, whip the remaining 1⁄4 cup of cream with the yolks. Stir a few Tbsp of the simmering sauce to the egg mixture, then stir the egg mixture into the simmering cream for 2 minutes. Remove from heat. Separate the puff pastry, ladle the sauce on the bottom half of the pastry, and top with the top half of the pastry. Serves 4.